This 600-round case of Winchester ammunition in .40 Smith & Wesson is just what you need for a long range session with your M&P, Glock, or other .40 S&W handgun. These cartridges propel a light 165 grain bullet to a muzzle velocity of 1,060 feet per second, producing external ballistics comparable to many popular carry loads. 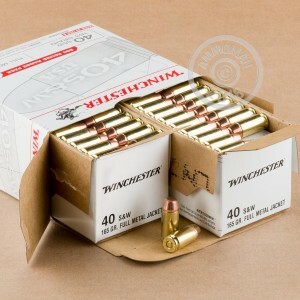 Winchester "white box" ammo is loaded in Oxford, Mississippi using non-corrosive Boxer primers and brass cases. It is one of the most popular choices for the range thanks to its blend of affordability and strong shooting performance. 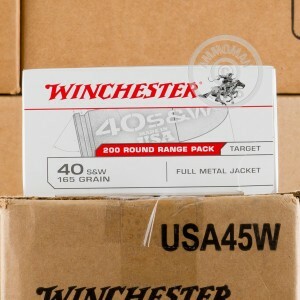 AmmoMan.com is the perfect place to pick up large cases of ammo like this one. With free shipping for all orders over $99, you can't help but save money with us! Exellent price, fast delivery, good customer service. Great Range Ammo. Zero FTFs or FTEs. Most honest on line ammo supplier I have ever dealt with. The price you see is the price you pay. No hidden charges. I will continue to do business with Ammo man. Ran several hundred thru new Glock 22 and a Sub2000. No FTE/FTF. Had no problems. Will buy them again. I like the way you do business. Great prices and fast shipping. Will continue to do business with Ammoman. have never had any issues with it. 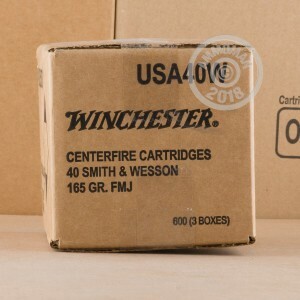 The Winchester white box ammo has never given me any problems. I shoot it in .40 and .45 with confidence. I'll be ordering more when I need too. Shot 100 rounds so far out the 600 i bought no issues. Great delivery and shoots well. I went thru that 600 rounds in one setting at the range. Never a misfire. Will be buying more. Shipping is to live for, cartridges arrived quickly to say the least. I ordered these cartridges for a Beretta PX4 and they preformed great. Round tip bullets loaded flawlessly every single time. I highly recommend for the range. I will be buying more.